Baltimore County Executive-elect Johnny Olszewski Jr.
Johnny Olszewski Junior becomes Baltimore County’s 14th county executive when he is sworn in Monday morning. 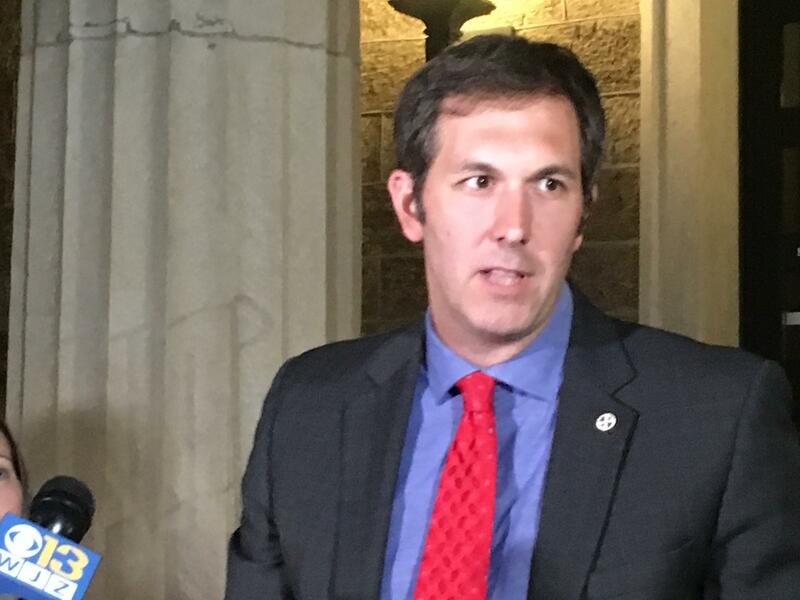 In a conversation with WYPR’s John Lee, Olszewski said that he will be taking executive action after he is sworn in but did not reveal what that will be. Olszewski said he will receive a budget briefing Monday as well. There are red flags that the county has taken on too much debt in order to build and renovate schools, so may need to cut that debt and increase taxes. And Olszewski said he has reached out to Governor Hogan since his election but has not yet heard back. Olszewski admits he wasn’t confident he would win when he started his campaign for county executive two years ago, following his defeat for a state senate seat in 2014. Olszewski: I wasn’t sure at all that we would land here. I was sure that we would be competitive and that we had a vision and a passion for this county that would resonate. Whether not that would translate in an electoral success was unknown for me. But the reasons we ran for office was because I wanted to transform the way Baltimore County was being run, where we’re going in the future, and I thought being part of that conversation was important regardless of the outcome. Lee: Are you going to be a tweeting county executive? Olszewski: I think I’ve already shown that I’ve been a tweeting county executive candidate and county executive-elect I see no reason to stop doing that now. Lee: So if people want to keep up with you that’s a good way to do it? You think you’ll be active daily? Olszewski: I don’t know if I’ll be able to respond immediately as people tweet at or interact on Facebook, but I’ve said you campaign the way you govern. And I’ve really tried to be someone who’s accessible and transparent. There’ll be a lot more live-streaming. There’ll be a lot of social media presence. Our web site will probably have a look at that. Any way we can be engaged in the community, cabinets in the community, the new outreach team, it’s all about that connectedness and that transparency that people really trust that we’re trying to do the right things for the right reasons and we’re not afraid to show what’s happening behind the curtain because it’s their government at the end of the day. Lee: In the last couple of weeks there have been a couple of reports, scary reports about climate change. And when we talk about climate change and what can be done about it, we usually think about it globally or nationally. Is that something that’s on your plate that the county can do its part when it comes to dealing with climate change? Olszewski: It’s not just an environmental imperative. It’s an economic one too. If we can have Baltimore County for example be the hub of wind assembly or manufacturing at Sparrows Point or elsewhere, we are not only helping address the challenge of climate change we’re actually putting people to work in the process. We also have to set forth ambitious goals for ourselves in terms of when we take Baltimore County itself off the grid and we put solar installations and renewable energies in our own buildings and we are leading by example on things like recycling. Lee: You mean the county government taking itself off the grid? Lee: So sometime early on in your administration you are going to set a goal for when the county is going to be off the grid when it comes to electricity, power, solar, wind, that kind of thing. Lee: You are a supporter of interim school superintendent Verletta White. You want her to have the job permanently. You’ve said that consistently. We have a new school board coming on. Are you going to take any sort of an active role to persuade the school board to hire her permanently? Olszewski: I am not a micromanager. We have a school board for a reason. As county executive I’m prepared to work with whoever our school system leader is. Until or unless the school board says otherwise, that’s superintendent White. Olszewski, as well as members of the County Council, school board and other elected officials will be sworn in Monday morning at the SECU Arena at Towson University.